This post may contain affiliate links. Your cost is the same, but it helps support the site and keep our freebies FREE! Thanks for your support! Thanksgiving is right around the corner and having your child help with getting ready for the festivities is the perfect way to bond and spend time with them. Often times, while we are cooking it, came become overwhelming and dangerous to have a child underfoot and that is where this All About My Thanksgiving Printable Activity Book can come in handy. With a little help, it can be a great Free Pre-school Printable or can be used alone for an elementary aged child. Print as many All About My Thanksgiving Printable Activity Books for your child or for your classroom! It makes a great keepsake for the years to come and can help your child with their writing skills and has plenty of room to showcase their creativity and artistic abilities. See below to print off your very own All About My Thanksgiving Printable Activity Book Free of charge for my followers! 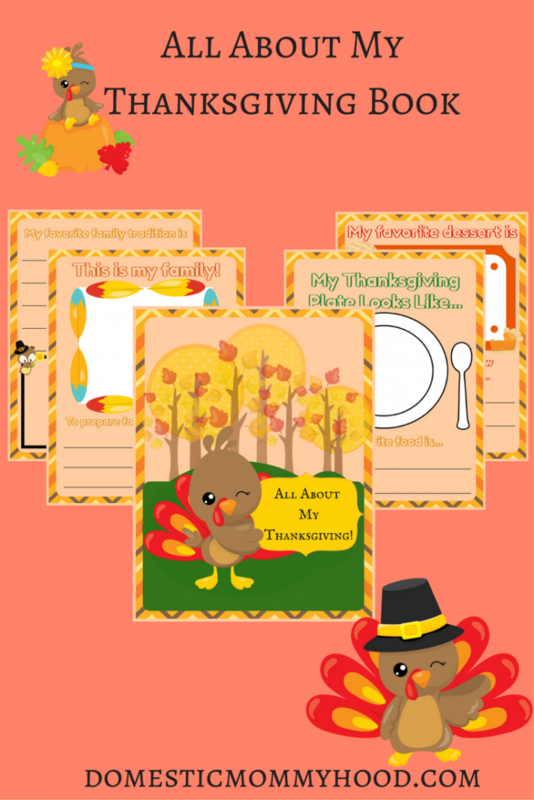 You may download the All About My Thanksgiving Printable Activity Book by clicking here. The All About My Thanksgiving Printable Activity Book is designed to bring some fun, creativity, and writing practice around the Thanksgiving Holiday. I would love to hear about your experience using this activity book. Feel free to leave pictures and comments in the comment section below. Instruct children wherever there is a white box to create their own illustration. Thanksgiving Books that we recommend reading to your child! LEGO Thanksgiving Harvest 2017 Holiday Seasonal Set – A fun way to play on Thanksgiving day! LEGO Seasonal Thanksgiving Feast – A great way to interact with your child and pretend play your upcoming Thanksgiving day! Fisher-Price Little People Thanksgiving Celebration – Pilgrims and Indian Friends– Celebrate the upcoming Holiday with this fun Little People Playset! Works great for young and old alike and can be used year after year! Don’t forget to check out these Fun Fall Kids Activities! Enter your email below for more future posts at Domestic Mommyhood!